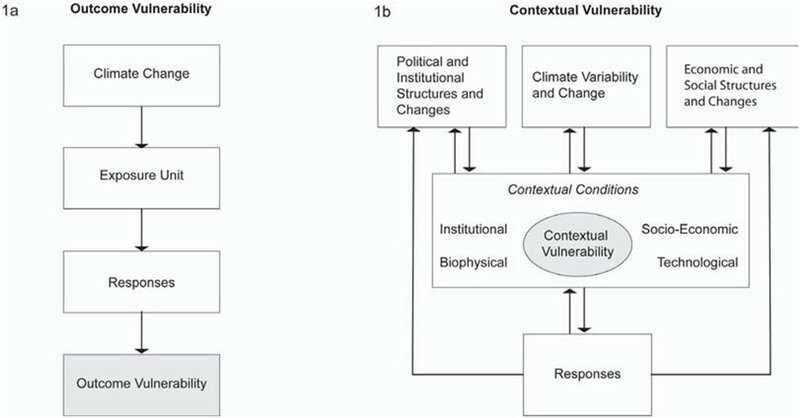 Discussion Of The Bottom-Up, Resource-Based Assessment of Vulnerability – “Wells Of Wisdom” By Robert L. Wilby | Climate Science: Roger Pielke Sr. Managing climate risks to fresh waters has so far been approached by designing action plans. Now adaptation protocols are integrating knowledge of water-system vulnerabilities into more flexible strategies to keep taps running and ecosystems healthy. Writing in Journal of the American Water Resource Association, Casey Brown and colleagues propose a flexible framework for combining information from climate models with the best features of ‘bottom up’ (or vulnerability-led) approaches to water management. greater a priori acceptance of uncertainty. Thus managers’ scenario-led strategies suppose that climate model projections are sufficiently reliable to make informed investment and planning decisions, placing emphasis on issues of scale and on climate processes that are poorly described in models. This can generate very wide predictions of river flows and lake and groundwater levels, of which the usefulness has been questioned, prompting appeals for greater investment in super-computing and climate modelling. Brown and colleagues began from a different starting point….Brown and his team developed a management process that could evolve with changing circumstances. Their first task was to integrate information about regional climate change with stakeholders’ perceptions ofvulnerabilities. For this they organized a series of technical meetings in which stakeholder groups from commercial shipping, coastal systems, hydropower, tourism and so on, met to define ‘coping zones’ in terms of the lake levels that they considered acceptable, survivable and intolerable. These lake levels then served as a common metric against which projections of climate change could be evaluated. My Comment: There is a caveat to part of this text.Unfortunately, as we discuss in our Pielke et (2011) paper, there is no demonstrated skill that the multi-decadal regional climate predictions have ANY skill in predicting changes in climate statistics from what already occurred in the historical and recent paleo-record. This does not mean that changes in these statistics are not occurring, but that we have no skill in such a prediction. The next step was to work out what regional climate states could tip the system into the less desirable coping zones, allowing the authors to home-in on the climate risk information that is most critical to designing the regulation of water releases into the lake. With reference to the most vulnerable features of the plans, tailored questions could then be asked of climate models about which of these states is more probable than others. My Comment: As I wrote above, the multi-decadal regional climate predictions have not shown skill at predicting changes in climate statistics. A more robust approach, as we presented in Pielke et al (2011) is to use the historical record, the paleo-record and worst case sequences of past weather events, but with today’s (and estimates of future) societal conditions. be implemented. Non-climatic drivers of the water balance, such as population growth, economic development, shifting societal priorities or changes in land cover could later alter stakeholders’ definitions of the coping zones, as well as the extent to which the lake levels fluctuate between them. But with an adaptive management process such changes can be incorporated and the regulation plans for the lake adjusted. Monitoring data will keep the plan in line with evolving conditions. Overall, this strategy should avoid ‘lock-in’, whereby future options are limited by earlier decisions. My Comment: This dynamic approach to adaptation should be encouraged as Rob Wilby succinctly and effectively discusses. This permits adjustment in the response to risk that are periodically reassessed as new information is obtained. Some experts contest that climate models were not originally conceived to solve adaptation problems and that palaeohydrological evidence could do a better job of testing system performance under extreme conditions that have actually occurred. Others assert that water management is already in crisis in large parts of the developing world, and that the imperative is not uncertainty about the future, but the certainty of present scarcity. My Comment: I certainly fit into this set of colleagues. I would add the historical and worst case sequence of observed weather events to this list, and not just the “palaeohydrological evidence”. Final Comment: I welcome Rob Wilby’s excellent essay and look forward to more colleagues joining us and moving towards the bottom-up, resource-based assessment of risks.